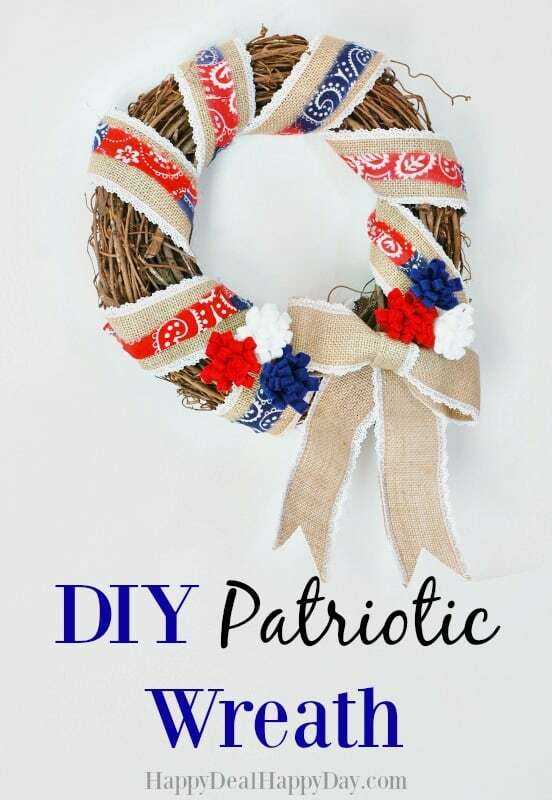 DIY Patriotic Wreath | Happy Deal - Happy Day! 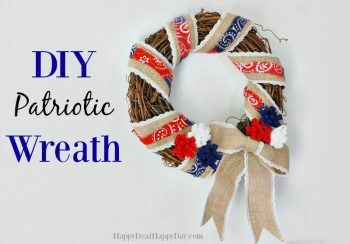 I made this DIY Patriotic Wreath that can be put up now in honor of Memorial day, and be kept up through July 4th! 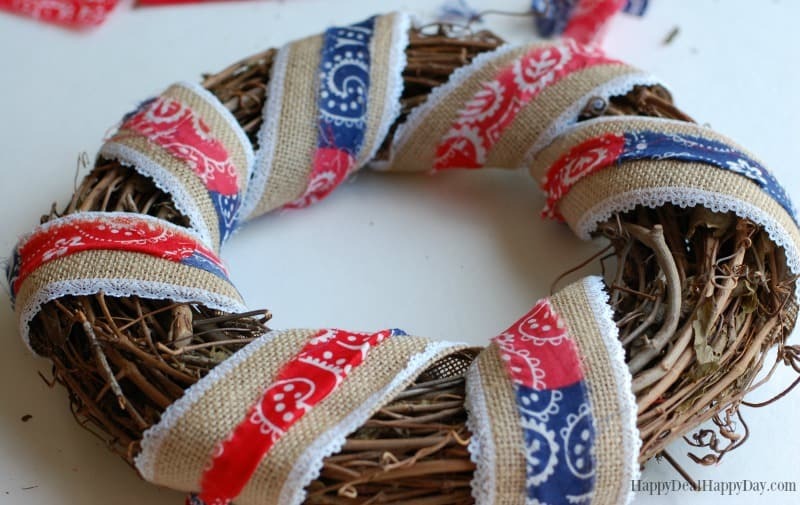 So here is my version of a down home, country, American, DIY patriotic wreath! 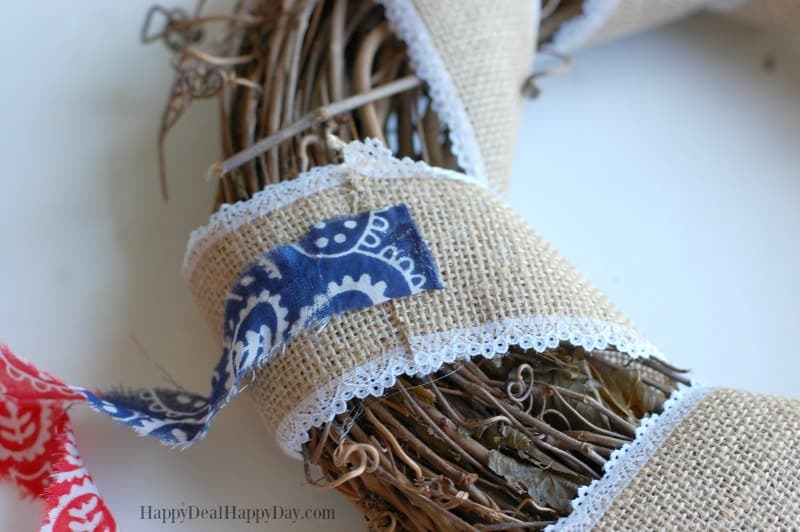 Start by wrapping and gluing the burlap ribbon over the wreath – I wrapped mine 7 times to make 7 loops of burlap around the wreath. 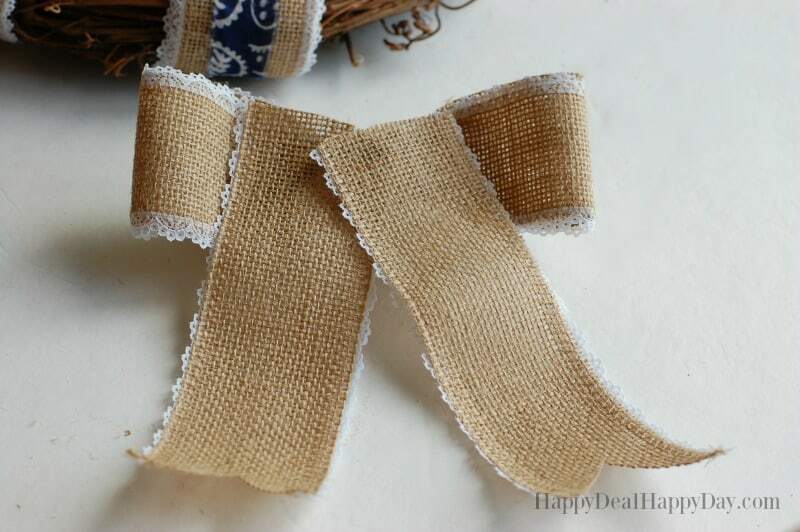 Now you will need to take your bandanna and will make “rustic” bandanna ribbon that will go over the burlap ribbon. Snip the burlap at about 1 inch apart at the end. 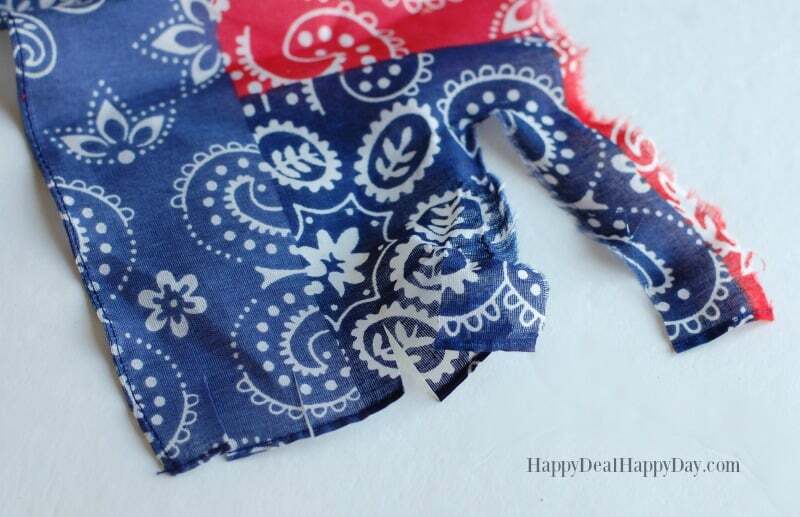 You will then tear the bandanna into strips. 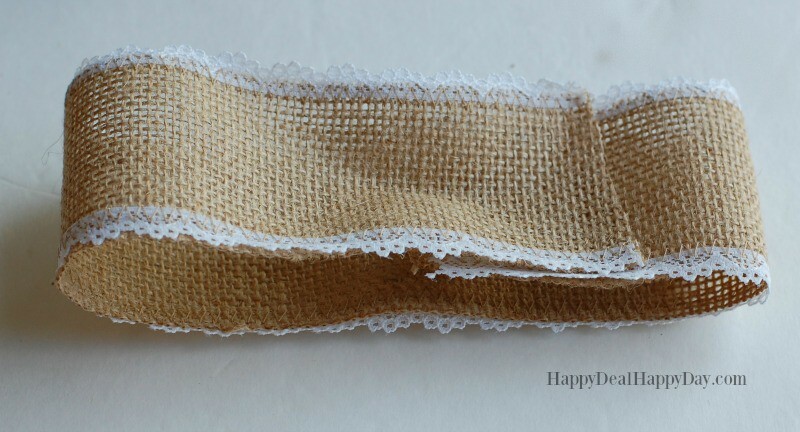 Use your one inch cuts as the start to wear you tear your strips. Tie the strips together to make one long bandana “ribbon.” The bandana’s are 22″ long – so only needed 4 strips tied together to make a ribbon of 88″ long. 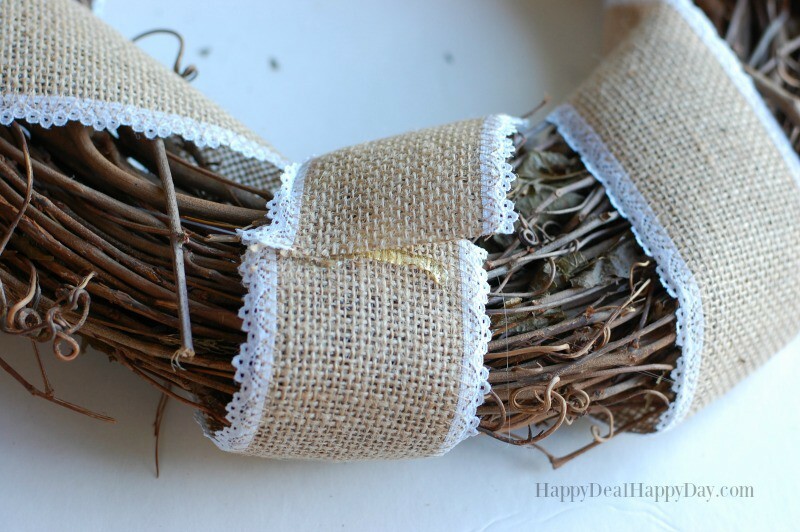 I didn’t use quite that much, but you will only need to tie together 4 strips to be able to cover the burlap ribbon on the wreath. 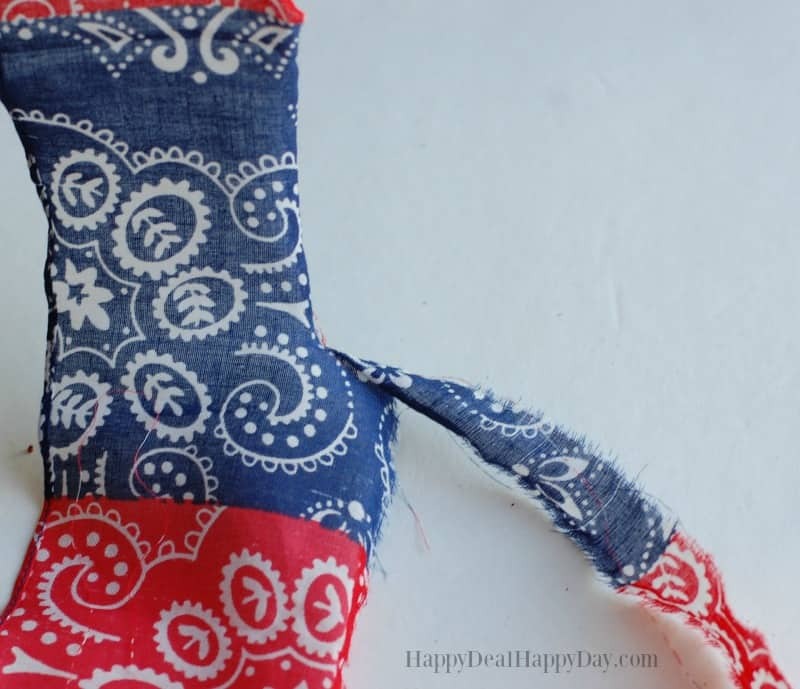 You will have left over bandanna material when you are done. 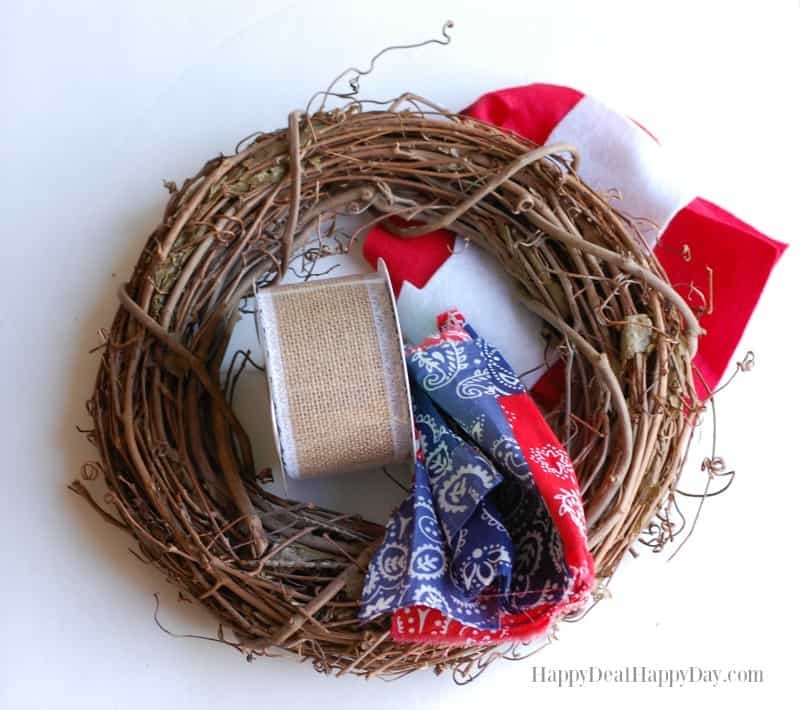 Now take the hot glue gun and glue the bandanna ribbon on top of the burlap ribbon. 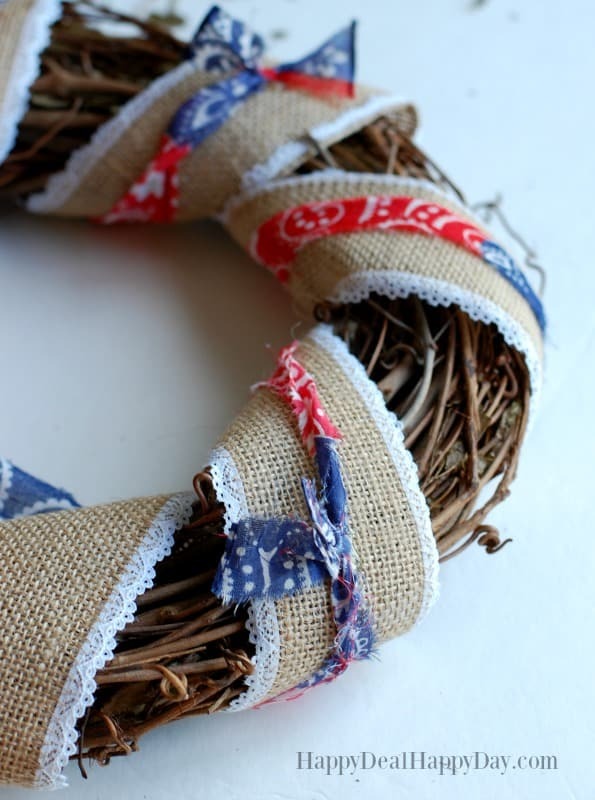 I made sure that the knots were all on the back of the wreath. Here it is with the burlap and bandanna ribbon complete. 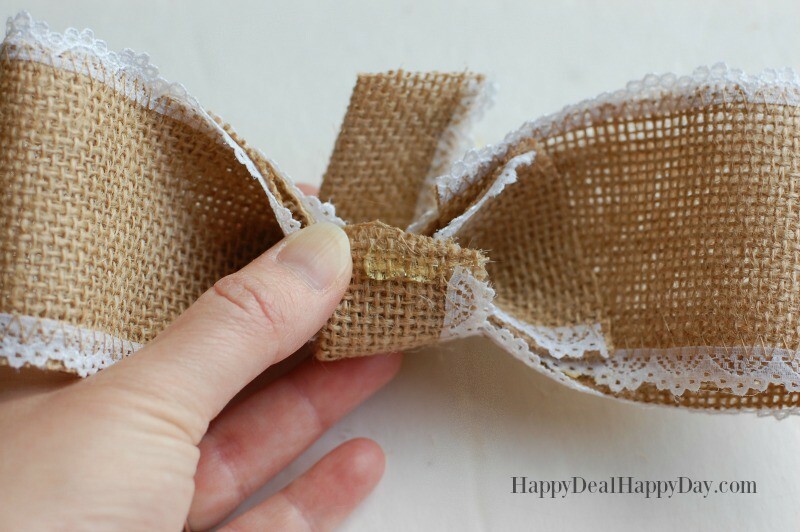 Now you will take more of your burlap ribbon and make a separate burlap bow. You will need to cute the ribbon at the length of 17.5″ and glue it into a loop. 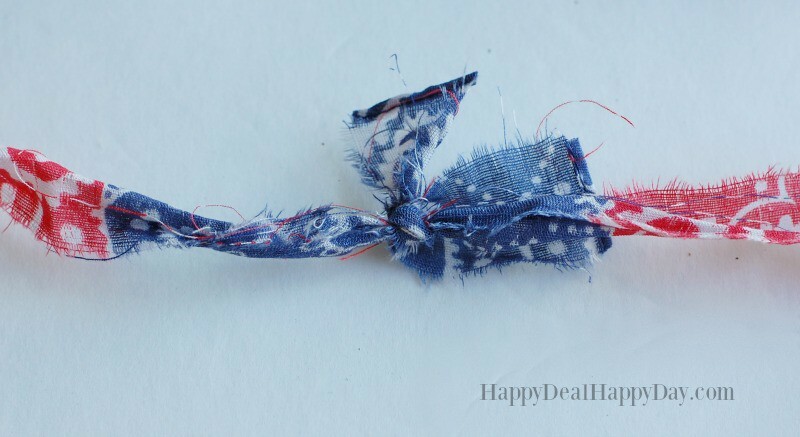 Now put a dot of glue in the center of the loop and glue it “hot dog bun” style. 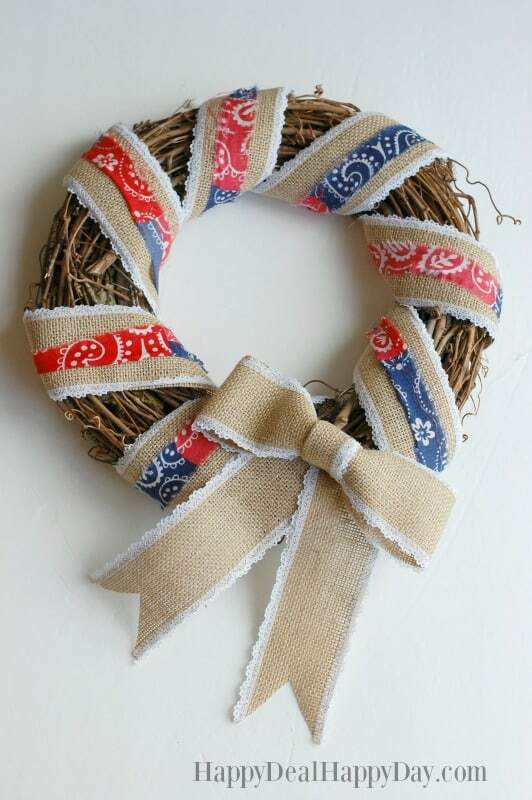 This forms the two sides of the burlap bow. Now cut another 4″ length of ribbon and glue that in half. Now loop and glue this around the bow. This makes the center of the bow. 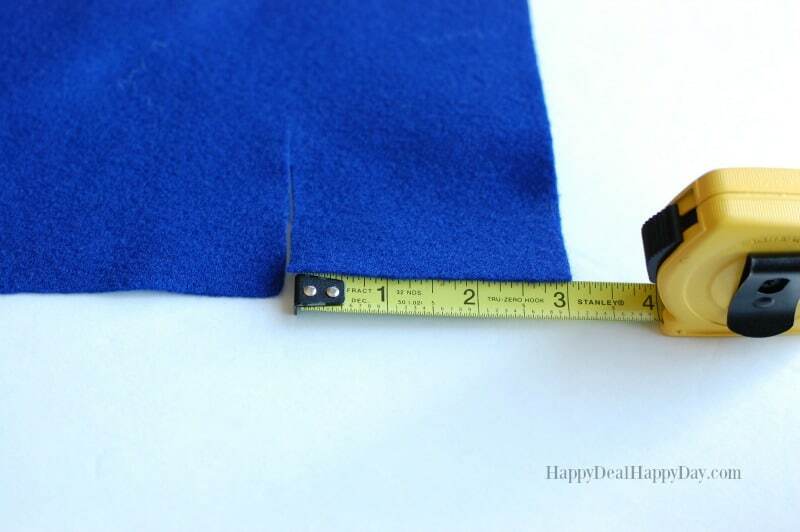 You need to cut (2) 8″ pieces of ribbon – which will make the ends of the bow. Cut triangle shaped notches at the end of both. Now hot glue these onto the back of the top of the bow. 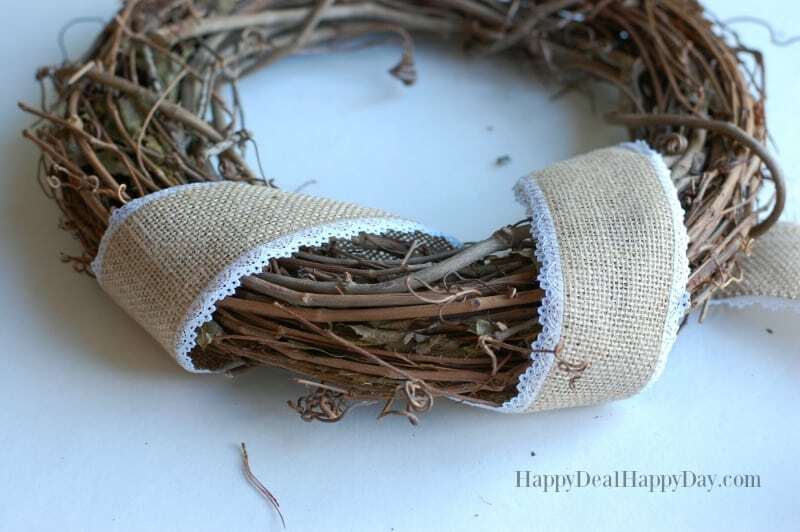 Flip it over, and you have the perfect burlap ribbon bow to attach to your wreath. Now you need to make some red, white, and blue “felt flowers” that remind me of fireworks – very appropriate for a patriotic wreath. 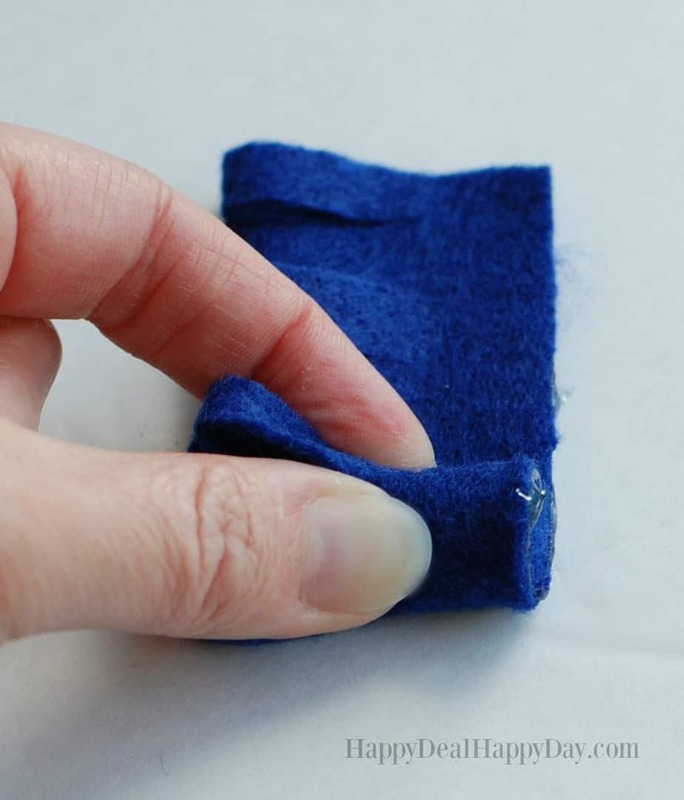 Cut a 3″ wide strip of blue felt. 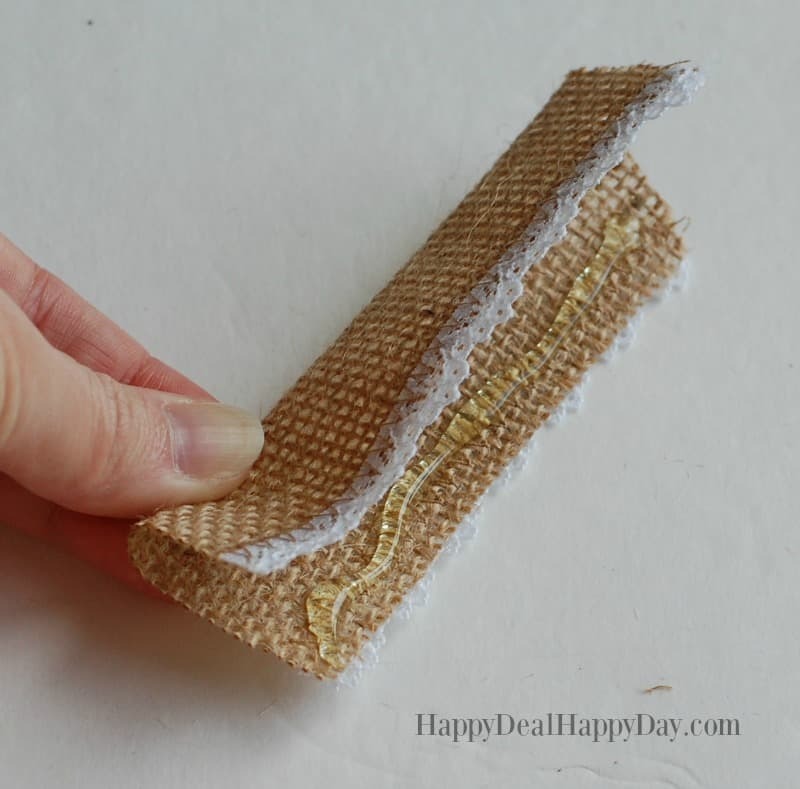 Hot glue that in half length-wise and make cuts 1/4″ apart – cutting half way down. You will end up with a piece 11″ long. This length will actually create 2 felt flowers, so you can cut your felt in half – to make (2) 5.5″ strips of felt. 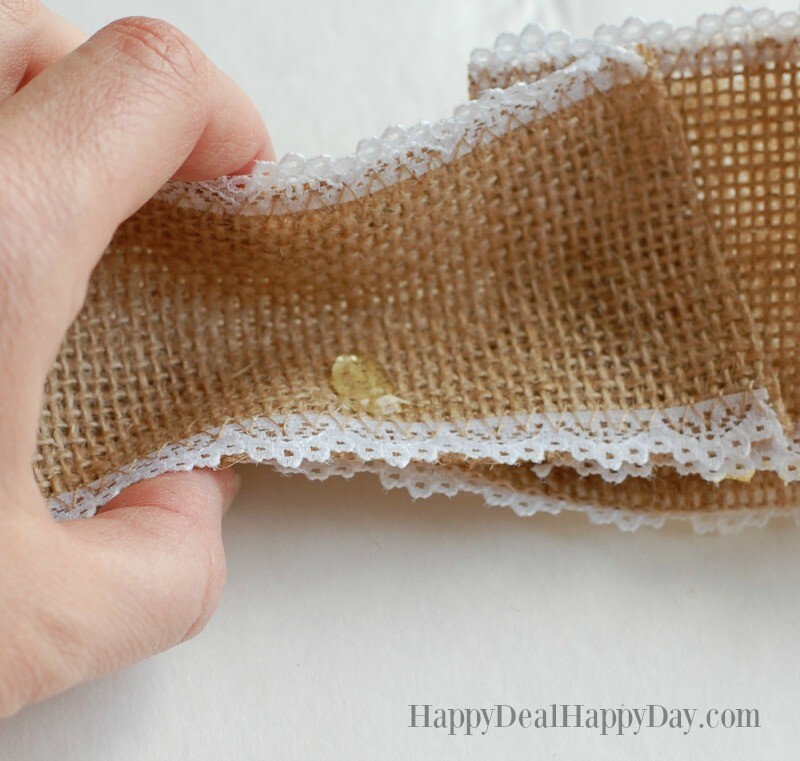 Take one of those 5.5″ strips and roll it tightly together. 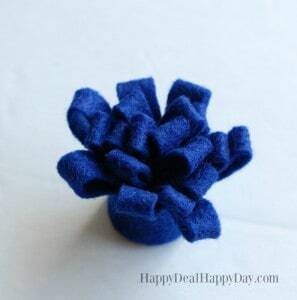 Glue the end securely when you are done rolling it into a flower. 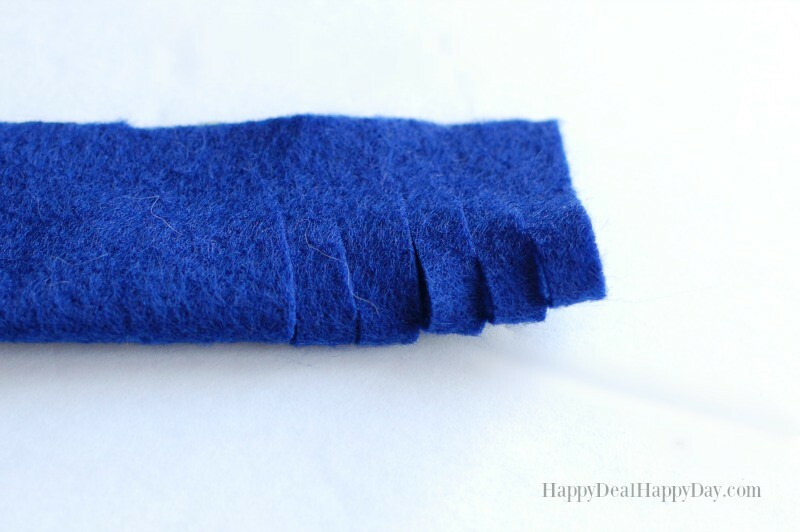 Do this for both blue strips, which gives you 2 blue felt flowers. 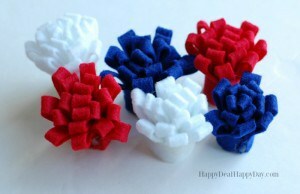 Do this as well with the red and white felt, creating 4 more flowers, for a total of 6. 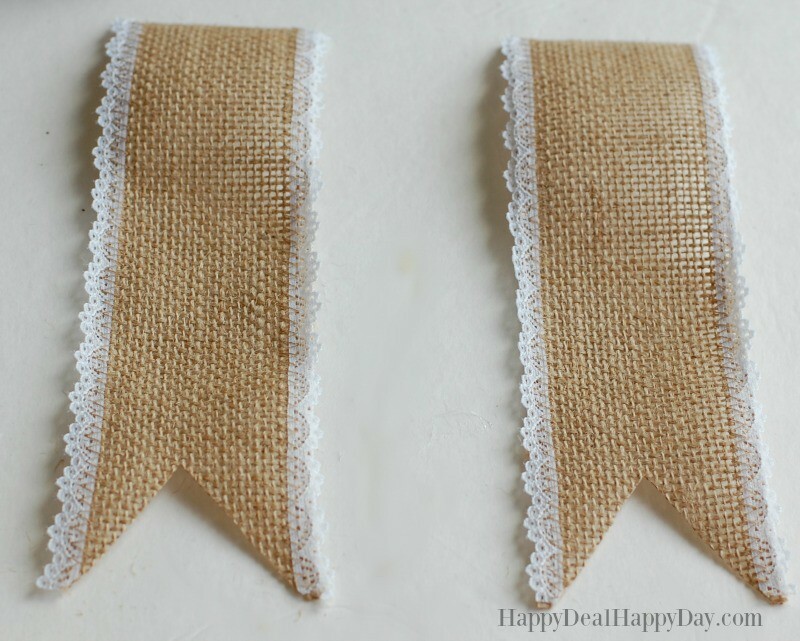 When you are done, hot glue these to the sides of burlap bow. ← $0.75 off ONE BAG OF KETTLE BRAND POTATO chips Coupon = Cheaper Than Store Brand Sale!